Abstract: Better performance. More channels. Reliable technology for any size of stage and every production: Digital 6000’s intermodulation-free design guarantees sufficient channels that can be relied upon, even in very narrow frequency ranges – while retaining maximum transmission performance at all times.More natural, lower-noise, higher resolution: Digital 6000 works with our proprietary Sennheiser Digital Audio Codec (SeDAC), familiar to customers from the legendary Digital 9000 series. You will hear the difference. More straightforward to use, more efficient regarding frequency space, smarter RF technology: Digital 6000 waves goodbye to past limitations and opens up new possibilities. Intermodulation is no longer an issue since the superior RF technology keeps the limited frequency spaces free for more channels. Digital 6000 does not produce any intermodulation, which allows operation in an equidistant frequency grid - neither transmission performance nor audio quality are compromised. The ease of working with this new product is already evident from the innovative user interface: relevance replaces excessive flickering, too many clicks and too little information. It goes without saying that Digital 6000 is compatible with dozens of capsule heads and antenna options. 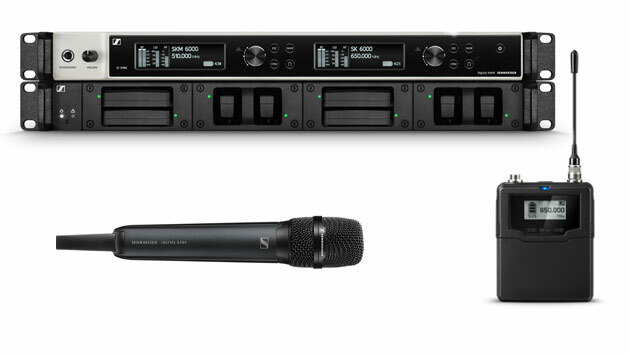 The series offers a superior quality in the long term that is unique in the realm of wireless productions. It also goes without saying that you will find a sympathetic ear when new requirements arise during day-to-day production. Two Dante™ sockets for redundant networks or daisy chains cabling? Consider it done. Introduction of the popular command mode for talkback functionality? Only one of the activated features in the latest software updates. The superior Digital 6000 platform is setting standards today – and staying ready for the challenges of tomorrow.